If you’re a pet owner and have an engagement photography session coming up in New Orleans, Baton Rouge or heck – anywhere – bring your furry companion along. Nacho may be small, but this Chihuahua dog is intense and intimidating! Katherine & Jeffrey’s engagement session in New Orleans began in Katherine’s backyard. I adore backyard photo sessions because they’re homey and relaxing! We shot at a nearby cemetery (can’t do a New Orleans session without a little cemetery involved) and went uptown on St. Charles Ave to the Four Columns Hotel to do portaits in front of the hotel and on the Street Car (Trolly Car) tracks. 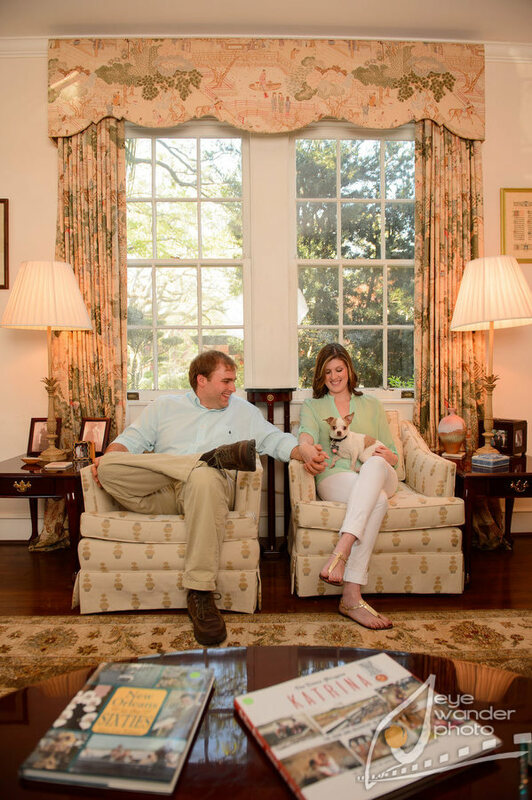 Katherine & Jeffrey plan to marry June 1, 2013 in New Orleans at the Orleans Club in Uptown. I enjoy testing my abilities to handhold a shot at 1/15th sec to show motion. Intermediate Photo class – Eye wander Photo – Baton Rouge – Come learn!